Conservative lightning-rod Ted Cruz often comes up in the speculative short-list of potential 2016 GOP candidates for the US presidency. Ethically, he occupies a sort of middle ground between the transparent power-machinations of Chris Christie and the genuine if sometimes awkward activism of Rand Paul. Transiting Pluto trine Cruz Saturn: Pluto lends power to Cruz's authority (Saturn). Saturn also rules his Sun. Cruz becomes more powerful this year in all likelihood, election or no. Progressed Venus conjunct Cruz Sun: probably a sweet year for the senator in general, and likely a lucrative one. Does some of this lucre come from a presidential or vice-presidential bid? 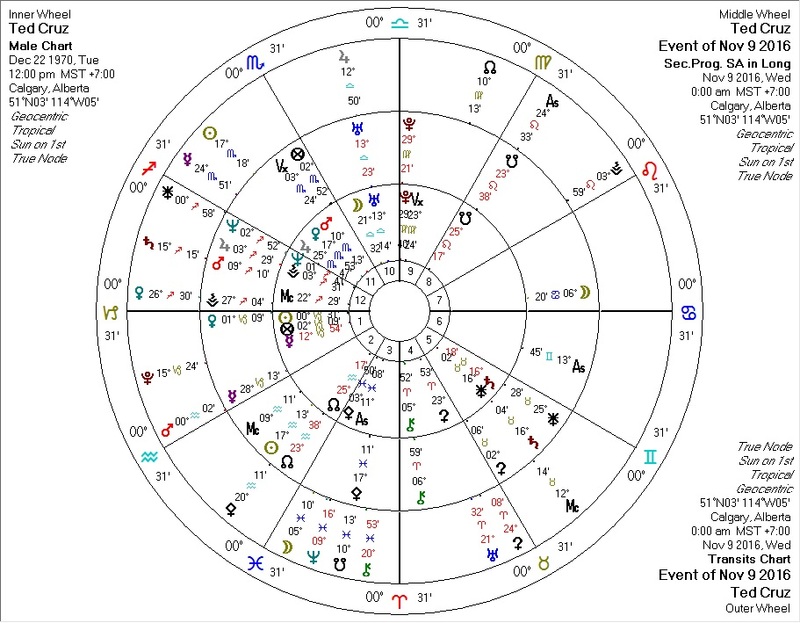 Transiting Jupiter conjunct Cruz Uranus: this may suggest popular appeal, and Uranus rules Cruz's North Node, suggesting, perhaps, a destined positive development? Transiting Sun conjunct Cruz Venus: a sweet day, in what we have established will be a sweet year. Transiting Mercury conjunct Cruz Jupiter: almost certainly some good news this day. Looks like Cruz will do well, assuming he's on a ballot that day. Theoretically, were he to share a ticket with Christie (assuming Christie doesn't disqualify himself), you'd have two astrological winners together. But Hillary's transits also look good that day. So it seems logical to guess that one or more of these three (Cruz, Christie, Clinton) will not be on the presidential ballot for the November 2016 election and instead win a lesser election or some other victory. In the unlikely event that Rand Paul represents the GOP for this election against Clinton, Clinton almost certainly wins. For libertarians and anti-war folks, of course, Paul would be the best ideological match, followed by Cruz. Clinton and Christie are both essentially hard-authoritarians who would not do much to undo the freedom and peace-killing trajectory of our recent presidents.